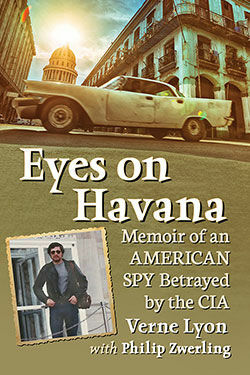 The book was co-written by ex-CIA agent Verne Lyon and tells his story of his time spent in the agency. As an aerospace engineering student in the 1970s at Iowa State University, when he was struggling to make ends meet, Lyon was recruited into the agency uncertain of what he was getting himself into. His involvement began by being paid to report back on the political opinions of his professors and before he knew it, he was living a secret life in Cuba, wed to a Cuban woman and being instructed to poison the milk of schoolchildren, according to Lyon. “The idea was to make the government fail so that the Cuban people would rise up and overthrow (Fidel) Castro,” Zwerling said. Zwerling attributes this to his background as an engineer and instruction-like style of writing. In addition to having written, co-authored and edited five books, Zwerling has published several plays and academic journals. Born and educated in New York, Zwerling’s first career move was training for the Unitarian Ministry. For two decades he served churches in Massachusetts, California and Arizona. The result was a compilation of interviews with locals, some of whom were related to government officials. This idea led him to pursue a Master of Fine Arts and a doctorate in Theater. Upon his arrival to what was then the University of Texas-Pan American, he learned it was one of the institutions selected by the CIA to recruit students. He found this troubling and began his quest for greater knowledge on the subject. In speaking with his colleagues, Zwerling discovered the CIA sent agents to instruct college courses at historically black and predominantly Hispanic universities — this in an effort to diversify its workforce and enlist students following the 9/11 attack. He edited a book with testimonies of other professors from around the country who were in the same circumstance. His quest to add the perspective of a CIA agent eventually led him to Lyon. From Lyon’s contribution and personal experiences as an ex-agent, the idea for a memoir was born. “Eyes on Havana” also follows Lyon’s time in prison and includes several art pieces he created while incarcerated. Lyon decided he wanted out of the CIA and wrote a resignation letter. This wasn’t easy, he added. Upon departing the agency and returning to the United States, Zwerling said Lyon was framed for an airport bombing and sentenced to 17 years in prison — of which seven were actually served. “His feeling was they’re trying to make an example of him,” Zwerling said. In hearing and learning Lyon’s anecdotes, Zwerling said, conflicts occasionally arose in having to omit “sensitive information” that could lead to trouble for other parties involved. Now officially retired, Zwerling is returning to California where his three children and three grandchildren reside. Already in the works is a new book, a collection of his own plays. In his downtime he plans to keep active by swimming, playing racket ball and possibly starting a community course in memoir writing. More information on Zwerling can be found on his website, philipzwerling.com. His books are available for purchase through McFarlandbooks.com.